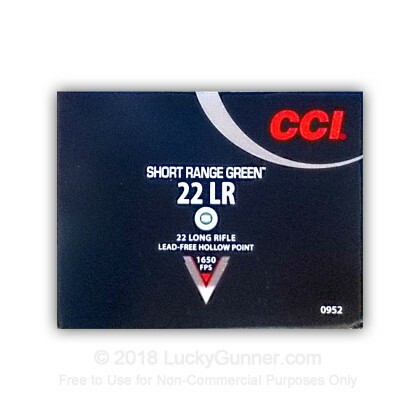 CCI's 22 Long Rifle Short Range Green cartridges are accurate out to 50 yards and are the perfect solution for the shooter who hunts or trains where lead-free projectiles are required by state or local authorities. This round is mounted with a hollow point projectile that is crafted from copper particle and polymer for a lead free, green shooting session. CCI has been manufacturing quality ammunition in Lewiston, Idaho located alongside the famed Snake River . Note: Accurate to 50 yards. Maximum range 3/4 mile. Use in ANSI sporting chambers only - Do Not Use in match chambers. May not function in all semi-automatic firearms. Use only in firearms having standard ANSI sporting barrel/chamber dimensions. Performs 1260 fps in handguns. I've read so many bad reviews on this stuff but it works great in my Ruger Mark 3 with 6 inch barrel. It always cycled and pretty accurate. I'll definitely buy more when it comes in.